Ultrasound in Obstetrics & Gynecology: A Practical Approach is an open access E-Book that presents a comprehensive review of ultrasound in obstetrics & gynecology. 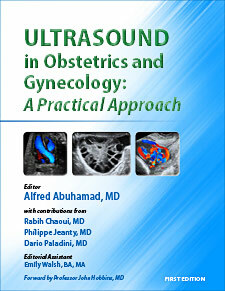 The E-Book is edited by Dr. Alfred Abuhamad, a renowned international expert on ultrasound with contributions from Drs. Rabih Chaoui, Philippe Jeanty, and Dario Paladini who possess an immense knowledge in the field and are recognized as giants in ultrasound imaging. The E-Book is filled with descriptive figures, tables and clips. Various tips that the authors use in their daily ultrasound practice and have been accrued through many years of experience are presented throughout. The E-Book contains detailed information on the practical aspect of the ultrasound examination in obstetrics and gynecology with technical details such as how to hold and orient the transducer, operate the ultrasound equipment and diagnose complex obstetric and gynecologic abnormalities. We believe that this open access E-Book will provide the foundation for ultrasound training in obstetrics and gynecology and should be downloaded by anybody who is involved in ultrasound imaging. Translations into various languages are forthcoming.